Perfect for the High Holidays or any other special time of the Jewish year, this Shofar was handcrafted in the Old World style. 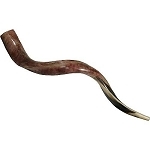 A fully polished, 100% Certified Kosher Yemenite Shofar, it features an easy-blowing mouthpiece. Size: 76-81 cm / 30-32 inch.